Address: 1620 S Whitehall Ln. Comments: Our small, organically certified family-owned ranch on the western Rutherford Benchland of California's Napa Valley grows Zinfandel, Cabernet, Petite Sirah, and Petit Verdot grapes, olives, Meyer lemons, and exotic pomegranate cultivars. We've made single-vineyard wines since 1999. Single vineyard bottlings are wonderful vehicles for exploring one's passion for taste and complexity in a wine. Not unlike many Zinfandel producers, we have long blended Petite Sirah from our own and neighboring ranches into our own wines. It continues mightily to the zest, white pepper spice and earthiness in our "Por que no" blend. In 2006, we began dedicating a small handful of our most interesting PS barrels to a limited release bottling featuring fruit from a gem of a dry-farmed vineyard in Calistoga. At Tres Sabores, as stewards of the land, we're devoted to exploring the character of the grapes we grow and producing wines that truly reflect the "voice" of the vineyard. Sheep, guinea hens, golden retrievers, bobcats, red-tailed hawks, bluebirds, swallows, and a host of other denizens contribute mightily to our efforts. 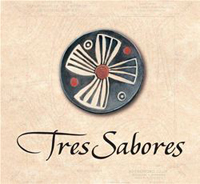 Tres Sabores: the "Three Flavors" in any wine; those of the Terroir, the varietal, and the Artisan. ~ Julie Johnson & family.